Ubisoft has (ahem) unwrapped a new trailer, details, and release date for Assassin’s Creed Origins’ upcoming Curse of the Pharaohs DLC. This story expansion ditches historical accuracy, in favor of a parade of killer mummies, giant scorpions, and other freakiness inspired by Egyptian mythology. You can check out a Curse of the Pharaohs trailer, below. “Curse of the Pharaohs, the third major expansion for Assassin’s Creed Origins, takes Bayek to find a mysterious artifact in Thebes, where he immediately runs into much more than he bargained for. Instead of the mortal and deceitful Order of the Ancients, he finds undead pharaohs materializing in the streets and slaughtering civilians. The Pharaoh’s Curse, as the locals call it, likely has something to do with all the grave robbers treating the Valley of the Kings like a strip mine for antiquities, forcing Bayek to hunt down key artifacts linked to each pharaoh in order to put them to rest. Curse of the Pharaohs’ map is a vast new territory filled with surprises. There’s Thebes, a massive city that boasts famous sights like the temples of Karnak and Luxor. Across the Nile, you’ll find the Valley of the Kings, pitted with the plundered tombs of Egyptian royalty. And as he works to quell the spirits of each restless pharaoh, Bayek finds his way into their individual afterlives, which exist as big, self-contained open worlds connected to portals in their tombs. Sounds like a solid collection of stuff! Evil mummies really are an underappreciated classic horror villain. 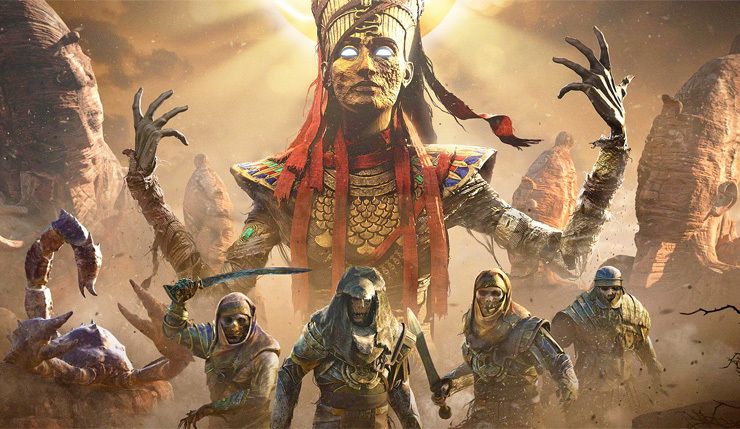 Curse of the Pharaohs is part of Assassin’s Creed Origins’ $40 season pass, which also includes the already-released The Hidden Ones story expansion. You can also buy Curse of the Pharaohs on its own for $20. Assassin’s Creed Origins is currently available on PC, Xbox One, and PS4. Curse of the Pharaohs has, unfortunately, suffered a minor delay – the DLC will now come out on March 13, rather than March 6.